In the last few days the media has gone into a frenzy because the most iconic woman in the world has gone through a monumental change. If your wondering who’s the bombshell keep in mind that she established the beauty standards of our younger generation of girls and women around the world over 50 years ago. If you still have no idea who I’m talking about, I’m referring to the one and only Barbie doll. It may sound silly and possibly frivolous, but this doll creates a huge impact on what beauty standards we imply to our daughters, sisters, nieces and children in general. For the last 57 years Barbie hasn’t really had any major significant changes, but Mattel has been under fire for a few years for its anatomically inaccurate portrayal of a woman’s body. Lets be realistic, if these body standards were realistic all women would be standing at 6 feet tall, weigh 100 pounds with a 32 inch bust, 16 inch waist and 29 inch hips. Basically she would be falling over and completely unhealthy. Don’t get me wrong, every woman has a different constitution so whats healthy for one girl, varies to the next. But why should we subject our girls to only this standard of ‘beauty’. Why can’t we have her look like the curvy girl with the tattoos and colored hair or the petite girl with the glasses and beautiful smile? 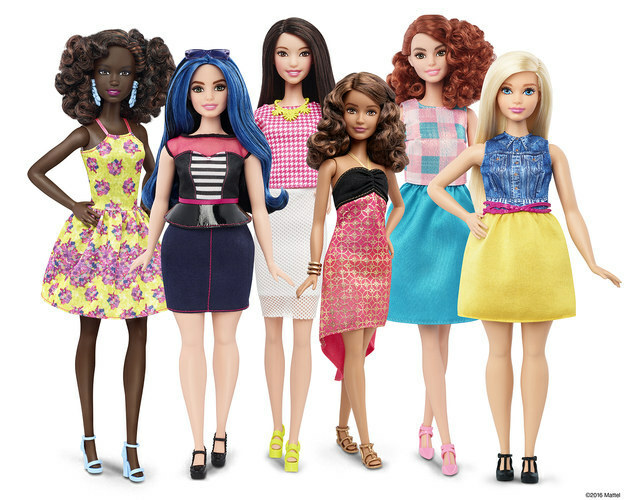 Since the times are changing, Mattel released various new models of what they are calling the ‘Fashionista Line’. These at the moment are only available online, but actually made me very curious of what were the different options they have to offer and if in reality they had the diversity, they said they would. I have to say that I was pleasantly surprised to see that the had beautiful Tall, Curvy, Petite and of course original models. They’ve added a wider array of skin tones, greater variety of ethnicities, 18 additional eye colors, 18 hairstyles and colors. The initiative of aiming for progress and not perfection is a wonderful step in the right direction for the acceptance of diversity and of positive body image. Let’s make all our girls feel beautiful, in reality they are with all of their exquisite imperfections.